Streams Tech, Inc. (STI) prepared a guidance document for developing bacteria Total Maximum Daily Loads (TMDLs) for the Virginia Department of Environmental Quality (DEQ) providing the details of potential data sources, data pre-processing methodologies, multi-year hydrologic and water quality model setup, development of TMDL allocations and addressing regulatory requirements to standardize the TMDL development process and the deliverables. Approximately 650 bacteria TMDLs have been developed in Virginia using a detailed approach in quantifying point and nonpoint bacteria sources, developing allocations and planning implementations. Streams Tech, Inc. developed bacteria TMDLs for waterbodies occupying 137 square miles of Prince William and Stafford Counties in Virginia and predicted water quality conditions using an HSPF model under a variety of rainfall and bacteria loading scenarios. STI delineated the watershed into smaller subwatersheds by topography and hydrologic connectivity, presenting descriptive data on each subwatershed and stream segment by developing calibrated and validating hydrologic water quality models and developing allocation scenarios. The developed model accounted for point and nonpoint pollutant discharges in the watershed, and results were used to determine effective TMDL allocations. The EPA approved of the TMDL in 2013. Streams Tech, Inc. developed a watershed model using BASINS/HSPF for Hyco River, which flows from North Carolina into Virginia, and performed initial model setup (e.g. BASINS/HSPF setup, watershed delineation, land use reclassification, FTable generation), weather data and WDM file preparation, hydrologic and water quality calibration and validation of the model for Michael Baker Jr., Inc. The project involved an eight year simulation of flow and pollutant concentrations on an hourly basis at various locations to determine the assimilative capacity of stream reaches and was used to develop TMDL allocations for various impaired reaches of the watershed. A stormwater collection system model was developed to identify problems in the existing stormwater infrastructure of Fort Bliss and find effective solutions to frequent flooding during summer storms. This was done using EPA's SWMM data, Geographic Information System (GIS) data calibrating with observed, site-specific flow and storm data, AutoCAD images of the sewer network, historic data, and data from surveys conducted on-site along with LIDAR survey data. The model was also used to demonstrate the system's effectiveness in design storms, providing insight as to how it would perform in a variety of rainfall scenarios. The Four Mile Run Watershed is one of the most heavily urbanized drainage basins in Northern Virginia, encompassing lands from four jurisdictions. Streams Tech, Inc. provided technical expertise to the Northern Virginia Regional Commission on hydrology, hydraulics, stormwater management, and water quality issues in support of the Four Mile Run Watershed Management Program. An existing model has been updated to EPA's SWMM 5 incorporating latest storm sewer system data, in addition to dealing with other floodplain issues of the system. In coordination with Halcrow, Inc. team, STI provided on-call services to Southwest Florida Water Management District (SWFWMD) under the Peer Review of Floodplain Results contract. A peer review was performed, which addressed the reasonableness of modeling and results used to update the floodplain delineations as part of the District’s Cooperating Technical Partner (CTP) responsibility to provide accurate digital flood maps. Streams Tech, Inc. developed a comprehensive water distribution and management system model for McAlester, Oklahoma that simulated pipe flow hydraulics, such as dynamic flow rates and pressures throughout the distribution system. The model helped to evaluate the existing water networks, optimizing the flushing program, and assess the current capacity and performance of the distribution system at any location. This could be used to plan for expansion (such as optimal sizing of new water main), potential locations for new towers and pumps, and other future development. GIS Portal is a web application developed under the project- Development of GIS Based Web Mapping Application for Project Planning of LGED. 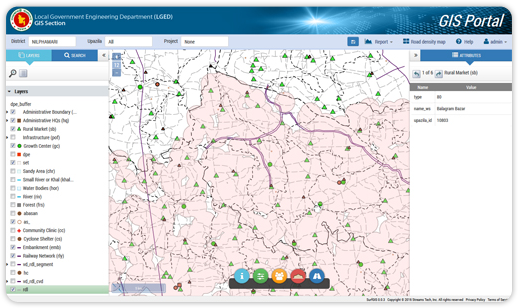 It enables users to prepare customized GIS maps, particularly to generate LGED’s road network map. Besides it plays the role of a decision support tool by providing project specific map generation and reporting options in the planning and monitoring activities. These features include identification and reporting of duplicate roads in project planning, estimation and mapping of a particular road or school served areas, and preparation of countrywide road density (proportion of paved roads) map. This project had another scope, to set linkage between mapping shape files with the central GIS database of LGED which have been successfully accomplished. The Water Map has been developed with an aim to provide a sustainable solution for the worldwide potable water resource management. Emphasizing on the crowd-sourcing, this app primarily connects mass people (non-technical) in contributing information for identification of the water sources, quality indicators and water use information. However, it also provides a base platform for the technical users to incorporate relevant water information. Streams Tech developed a web based monitoring system for the Shamerto project of HELVETAS Swiss Intercooperation. Shamerto is a project designed to strengthen skills, employability and income of people involved in agro-food processing Small, Micro and Cottage Enterprises (SMCE). The monitoring app tracks quality and quantity of the skill development trainings, performance of the trainers and trainees up to a certain period after the trainings conducted, and income and employment status of the program beneficiaries. It also provided a comprehensive database management system for the project, controlled user access, and a user-friendly interface for both desktop and mobile devices. Streams Tech developed an online database for the Sharique project (phase IV) of the Swiss Agency for Development and Cooperation (SDC). The project is implemented by the HELVETAS Swiss Intercooperation, and aimed at contribution to the empowerment of local citizens to make inclusive, gender sensitive and pro-poor collective choices about their lives and livelihood through effective local government systems. The fourth and final phase of the project has a focus on institutionalizing its tools and approaches. The online database system developed by Streams Tech provides a Geographic Information System (GIS) environment, and is used to institutionalize and manage project data of different phases in an integrated, easy and cost-effective way. The system is also used to track progress of ongoing project activities, to evaluate implementation status, and for decision support. Streams Tech developed an automated and powerful Monitoring and Evaluation (M&E) system for the consortium of the CARE, the Helen Keller International (HKI) and the World Vision International (WVI) under the SHOUHARDO III program funded by the USAID. The M&E system allows for tracking of results and evidence for adaptive management. It is a comprehensive tool, which has incorporated both quantitative and qualitative participatory methods of monitoring and evaluation processes. The tool is designed to assist the consortium in managing information of the USAID program, and create a learning platform for improving or adapting program activities. It also helps users collect routine data, conduct surveys, and analyze and report information in a geospatial environment. The system plays an essential role now in tracking progress and evaluating effectiveness of the program activities. In association with the Clear Innovative Technology Solutions, LLC., USA, Streams Tech has been providing development and maintenance support to the Electronic Management Operating System (eMOS) of the DB&A, Inc., USA since 2016. eMOS is a comprehensive operations management software that help DB&A’s clients plan, monitor and manage their organizational processes, behaviors and performance. DB&A provides cross-industry management consultancy services around the globe and offers eMOS as the key decision support tool for process improvement and increased efficiency. The type of industry served and the organizational need define functions and capabilities of eMOS. Streams Tech takes input from DB&A in understanding specific requirements of a client, works in collaboration with Clear Innovative Technology, and then implements features of eMOS to improve productivity, streamline business process, document challenges and barriers, track progress, and optimize resources. Technologies: AngularJs, OpenLayers, PostgreSQL with PostGIS, SQL Server, MongoDB, GDal, Python, GeoServer, Java REST Service, ASP.NET MVC. 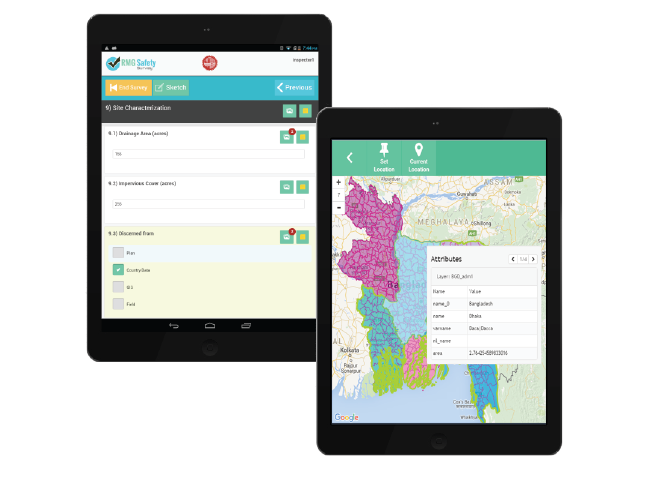 Streams Tech developed a smart data collection app for the Management Sciences for Health (MSH) – a USAID funded organization in its CTB project. The project was aimed at improving TB problem scenario in the country. There were two forms in the CTB program for Zone 3, 4 and 5 of the Dhaka South City Corporation such as: FAST (Find patients Actively by cough surveillance and rapid molecular sputum testing, Separate safely, and Treat effectively) and PET (Post Exposure Treatment). The objective of implementing the data collection app was to equip these two forms with a smart tool that can help collect, share and manage TB related information. The app enabled real-time data collection using smart devices, recording and storing data offline, and viewing data in informative dashboards. Streams Tech also designed necessary security modules, provided training to the staffs of CTB project, and hosted the program in a secured server. Technologies: Jakarta EE, Spring Boot, JPA, PostgreSQL, Angular 4, Native Android. 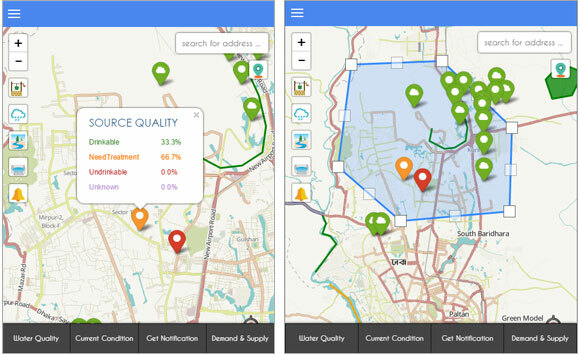 Streams Tech Ltd. developed a comprehensive survey application: SiteQ to support the BRTC Institute of Bangladesh University of Engineering and Technology (BUET) in the Improving Working Conditions in the Ready-Made Garment Sector in Bangladesh program of the International Labor Organization (ILO). This app enabled efficient management of survey questionnaire using smart devices, performing both online and offline site survey for the Ready-Made Garment (RMG) factories, and generation of useful summary statistics reports. There were a number of flexible and dynamic options for setting different types of survey questionnaire in SiteQ. In addition, the app provided a Geographic Information System (GIS) map environment for tracking geospatial footprint of survey works. SiteQ was used by the BRTC staffs to collect and process site inspection data from more than 1500 RMG factories of Bangladesh under the ILO program. Technologies: ASP.NET MVC, GeoServer, PhoneGap, MongoDB, OpenLayers, AngularJs, JQuery, HTML5, Web Socket, OAuth, Java REST Service, PostGIS. 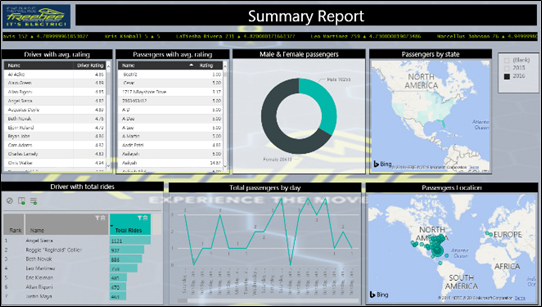 Streams Tech developed a substantial Power BI embedded system in the web portal of the Ezispeak to facilitate client-specific dashboards and reporting. The Ezispeak works in the language service market and is a renowned telephone interpreting service provider in Australia. They have an enriched client-database which is used to perform essential analytics and provide decision support solutions. 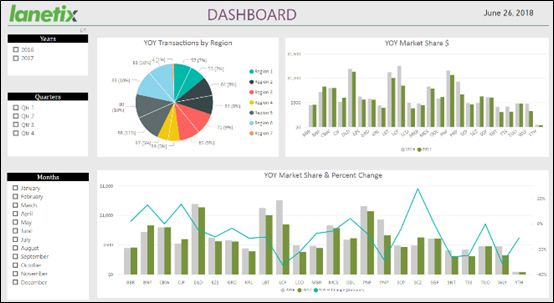 However, the nature and information of every client are unique which require the data visualization dashboards to be completely customized and client-specific. 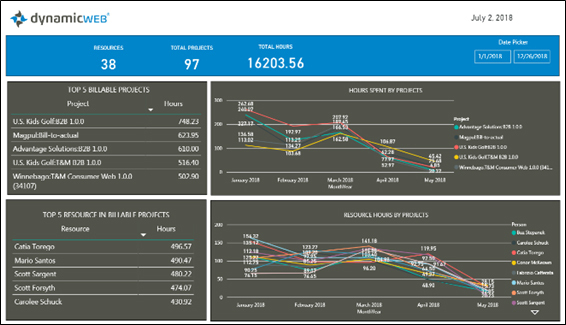 The Power BI embedded system developed under this project resolved the above challenge and improved the efficiency of the Ezispeak’s operation. 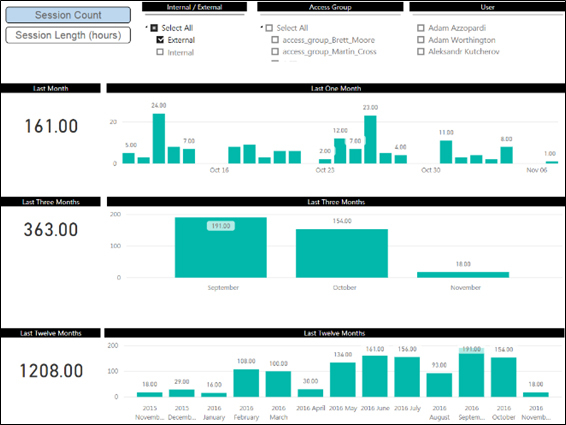 Individual clients now can get a direct access to their own dashboards on the Ezispeak’s web portal and they don’t require any additional or separate log-in to the Power BI system. The embedded system is also flexible and adaptive which helps Ezispeak develop and customize dashboards and reporting modules on the basis of a client’s requirements. Technologies: ASP.NET MVC, AngularJs, SQL Server, Power BI. Streams Tech developed a comprehensive and customizable dashboard development framework for the IQVIA. IQVIA is a global organization working in the healthcare industry and it deals with sales and business information of market leading pharmaceuticals such as Novartis, Johnson & Johnson, Pfizer etc. It has a complex and exclusive business model that collects a wide range and big amount of drug sales data, performs multi-dimensional business analytics, and sells the data driven decision support and business insights to the pharmaceutical companies. The company develops numerous data visualization dashboards for the clients it deals with, and therefore frequently requires flexible and tailored solutions. In this project, Streams Tech developed a powerful dashboard development framework to equip the IQVIA with a system which is capable of developing new or customizing existing dashboards as per requirements. Use of the framework has reduced redundant and repetitive efforts, made the business process seamless, and increased the operational efficiency of the IQVIA in delivering solutions to their clients around the globe. Technologies: ASP.NET MVC, AngularJs, SQL Server, Xamarin. Streams Tech personnel supported the Lanetix, USA with implementation of a comprehensive performance management dashboard for the organization. The dashboard uses information of the company that include periodic revenue and cost, project pipelines, implementation status and efficiency of all ongoing projects, leading clients and customers, top performing employees, upcoming opportunities and the Customer Relationship Management (CRM). It measures overall company performance on the basis of a set of performance indicators designed by the client. These indicators are displayed on the dashboard in form of a variety of charts, and tables. The dashboard has enabled Lanetix to continuously monitor its operational performance and thereby ensure a sustainable business growth. Technologies: SQL Server Database, Power BI. The Dynamic Web, USA developed a performance management dashboard in order to monitor progress and efficiency of their project activities and human resources. Streams Tech personnel provided a full-cycle software development support for this purpose. The dashboard uses information of ongoing projects of the organization that include billable hours and cost, resource input and utilization, present implementation status, and overall execution efficiency. It measures progress and efficiency of individual projects on the basis of a set of performance indicators designed by the client. In addition, a list of top or worst performing projects are also displayed for continuous monitoring and formulation of necessary action plans. The dashboard is operated by the organization as one of their key decision support tools for a successful project management. Streams Tech personnel provided necessary technical assistance and programming support to the Signature Trend Advisory (ST Advisory), Malaysia for development of a comprehensive commodity monitoring dashboard. 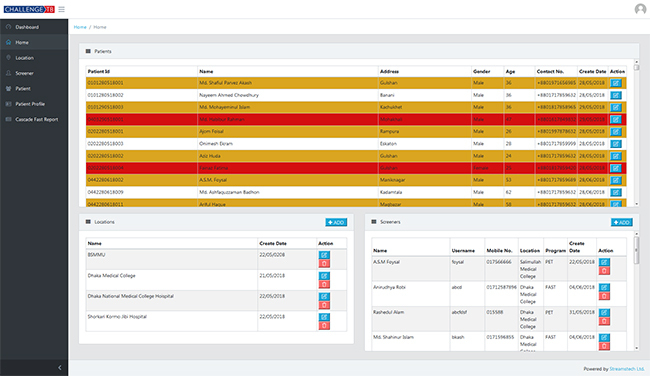 The dashboard was developed for a government organization of Brunei. It was aimed at analyzing and displaying commodity information of the agriculture industry such as crop characteristics, crop yield, livestock, farmers’ demography, commodity export-import status etc. 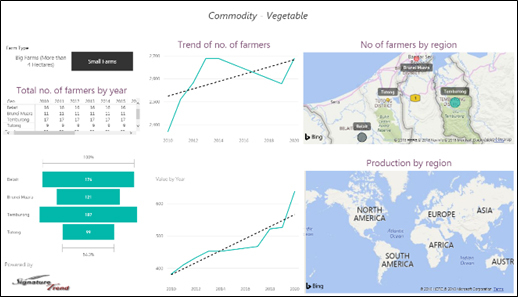 The dashboard also provided useful insight on geospatial characteristics of agricultural commodities, their productions and sales distribution, and overall market trend. Streams Tech personnel provided necessary technical assistance and programming support to the Signature Trend Advisory (ST Advisory), Malaysia for development of an attendance management dashboard. 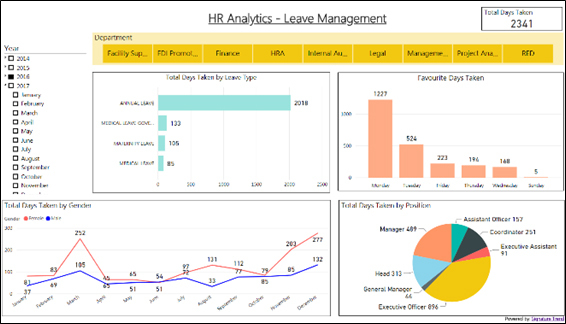 The dashboard was developed to monitor and manage employee attendance of one of ST Advisory’s client’s organization. It required employees to provide their attendance information regularly by signing-in on a web based dashboard. The client used the tool to efficiently monitor employee attendance behavior, leave status and work performance. Technologies: SQL Server Database, SSIS, Power BI. Streams Tech personnel developed a comprehensive employee training management dashboard for one of the clients of the Signature Trend Advisory (ST Advisory), Malaysia. The client formerly used numerous spreadsheets to collect, store and manage its training related information such as present and future training needs, current status of trained resources, ongoing and future training plans, outcomes and efficiency of the past training programs etc. 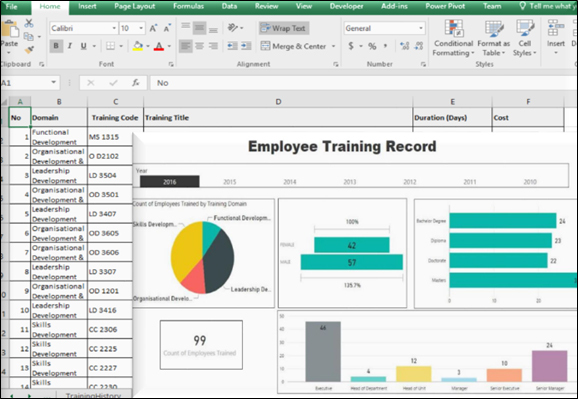 It looked for a powerful data visualization tool like a web based dashboard which could help analyze the wide array of spreadsheet data it had, and monitor and manage training activities. Streams Tech personnel, in support for the ST Advisory, designed the complete solution architecture and developed the training management dashboard to serve the purpose. The dashboard used complex and multi-dimensional training information from those spreadsheets, performed essential data analytics, and produced useful data visualization in form of charts and tables with training statistics. Technologies: SQL Server Database, SSIS, VB Script, Power BI. Gapminder (www.gapminder.org) is an independent Swedish foundation that promotes fact based understanding of our world and environment through an in-depth statistical analysis. It produces knowledge and educational resources and presents them to the people with reliable statistics for a better and more accurate understating of what’s happing surrounding them. The foundation develops data visualization tools that enable people exploring abundant resources of statistics of different public and private sectors in easier, more meaningful and holistic way. Streams Tech personnel provided necessary technical assistance and software development support to Gapminder in building these tools and technologies under the project. The assignment was quite challenging as the developers had to deal with data that practically had no limit in volume and variation. These data came from multidisciplinary areas such as social, economic, political, demographic, geographic, climate, ecological, environmental etc. Streams Tech had to transform the collected data from various sources into a uniform state, perform necessary statistical operations to standardize them, and then present them together using a wide range of visualization tools. This project demonstrated key benefits of applying information technology in understanding the state of our world through facts and figures. Technologies: SSAS, SSIS, SSRS, Tableau, Power BI, Custom C# Application. The Dynamic Web, USA developed a performance management dashboard in order to monitor activities and performance of their sales representatives distributed with different products and clients, and over different geographic regions. Streams Tech personnel provided a full-cycle software development support for this purpose. 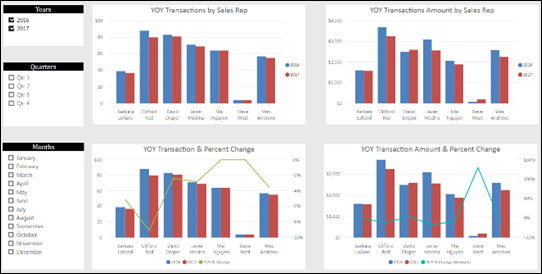 The dashboard used information of sales representatives from a variety of sources, and produced a set of performance indicators with charts, and tables. Sales performance were displayed and reported according to the user specified interval e.g. on monthly or annual basis. Technologies: SQL Server Database, SSRS. Freebee is an electric transportation service in Miami, Florida, USA. People uses this service through the Freebee App to physically move or transport masses within the geographic coverage of Freebee in Miami. Therefore, a wealth amount of client, user, traffic and product data have been acquired by the service through this app. Streams Tech personnel developed a comprehensive dashboard for fleet management with use of data acquired through the Freebee app. It helped the service track and assess driver and passenger ratings, concentration of traffic and mass movement, and response, feedback and behavior of the customers. Freebee uses this dashboard to get useful business insights and make informed decision in its course of actions. Streams Tech personnel designed and developed a powerful visual query builder to deal with Google’s big data online and organizations’ own database together for the IntelliSmart, Australia. Google uses its BigQuery platform to explore and analyze its big data, which is significantly different from normal query building applications and it requires moderate to advanced level learning curve. On the other hand, data driven organizations use their own and tailored database, which often appear different from those of Google. The project required to implement a powerful tool that can enable organizations using information from their own database and Google’s relevant big data together in a common visual workspace and performing essential decision support queries. Streams Tech developed the query builder with an informative dashboard and useful analytics derived from the Google’s big data and the organization’s database. Technologies: SQL Server Database, .NET Application. Streams Tech personnel has good experience with developing informative dashboards using data from the Internet of Things or IoT devices. In form of an outsourcing service to a privately owned client, Streams Tech developed a powerful IoT dashboard for electric utility data monitoring and management. Modern electric utilities use a wide variety of IoT devices that record and store essential operating data. For efficient monitoring and management these data also provide a baseline for their SCADA systems, wherever available. The dashboard used data from multiple IoT devices located in an electric utility network, performed useful and decision support analytics, and displayed key operational indicators. It was capable of reading data from different types of IoT devices that ensured maximum flexibility and integration in data visualization. Technologies: Azure Database, Power BI. Streams Tech personnel designed and developed a comprehensive performance monitoring dashboard for the Solve Technology, LLC. The dashboard was used to monitor school activities. Formerly, the client used a set of customized analytics module other than those from the Google services, which were developed by themselves. Those modules were developed with use of primarily MySQL Data and Crazy Egg Statistics. Streams Tech integrated and utilized information from those modules along with Google Analytics in order to perform essential query and report useful statistics in form of charts and tables. These illustrations are used to monitor and evaluate activities of schools. Streams Tech personnel provided necessary technical assistance and programming support to the IMS Health (now IQVIA) in developing a comprehensive performance management dashboard of several national and international pharmaceutical companies. IMS Health is a global organization working in the healthcare industry and it deals with sales and business information of market leading pharmaceuticals such as Novartis, Johnson & Johnson, Pfizer etc. It has a complex and exclusive business model that collects a wide range and big amount of drug sales data, performs multi-dimensional business analytics, and sells the data driven decision support and business insights to the pharmaceutical companies. The performance management dashboard helps the client of IMS Health understand and evaluate their market position, monitor sales status over different geographic regions, and make informed decision on next action plan. Streams Tech personnel designed and developed the complete solution architecture for the dashboard that ensured maximum value for the IMS Health in continuation of their business. Technologies: SSAS, SSIS, SSRS, Custom Web Application.